I grew up in the segregated south. It was something that came with my birth. Like many other southerners, I was friendly to my black neighbors and friends. On the farm in the late forties and fifties we worked together in the fields, ate food prepared by black cooks, and played together. I remember playing with similar aged black boys in the dammed up stream on our farm that served as our summer swimming hole. 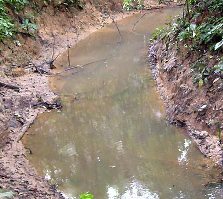 Many Oconee farm boys of the 40s and 50s, black and white, played in streams and would dam them up for a summer swimming hole.Our farm had streams or branches running throughout it. Some were spring fed. We did attend separate schools, churches etc. Having been born into that society, many of us had never widely traveled and knew no other way of life. As we approached adulthood, relationships changed because of the culture. I never felt hostility or animosity toward blacks. Traditionally, grown black and white men would acknowledge each other with a nod of the head. As a teenager, I would wave (throw up my hand) at blacks working in the field. One middle-aged black man, R. J. Darden, lived on the farm in a tenant house and worked in the fields for my father for many years. He was a heavy man that was called “Fat”. He was an excellent tractor and equipment operator. I remember that initially he was a little awkward in returning the wave when I would throw up my hand. Brown Vs. Board of Education was decided in 1954 (I was in the 8th grade). The Supreme Court ordered an end to school segregation. The news created a lot of talk among whites who had lived their lives in segregated society. I had been graduated from High School almost ten years when Oconee County Schools were integrated. 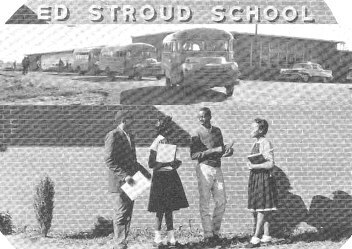 Prior to that, black students attended Ed Stroud School on Colham Ferry Road, south of Watkinsville, where the present Colham Ferry Middle School is located. Black Oconee County graduates of 1958 graduated from Ed Stroud High School on Colham Ferry Road south of Watkinsville. I, and other white Oconee County graduates of 1958, graduated from OCHS Mars Hill Road, north of Watkinsville. 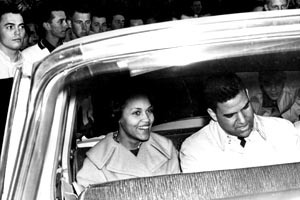 While my generation did not experience public school integration, I was a student at UGA (BA 1962) when it was integrated in 1961 with the admission of Hamilton Holmes and Charlayne Hunter. I, along with most students, did not participate in the rioting or demonstrations but witnessed some of it. I saw the entourage of Federal Marshalls and FBI agents escorting the students to classes on the UGA campus. Once as I was going up the steps of LeConte Hall, Math Building in 1961, and paused to look around at the commotion below at the back door entrance, an agent said, “Move on!”. Without hesitation, I did continue onto my class. The University and authorities were aggressive in keeping down violence or demonstrations. I remember seeing Dean of Men William Tate running around North Campus taking ID cards of demonstrators during the first days of integration. Some advanced ROTC students got their records flagged. Some were expelled from the law school. 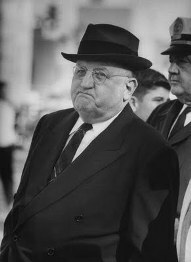 Dean William Tate was an imposing and stern person. He put the ‘Fear of God” in many a UGA male student during his tenure as Dean of Men. As a student, I went to his office one day to get approval of a Class Excuse for family reasons. He questioned me until he was satisfied that the request was legitimate and then he was gracious. He loved Georgia and the University of Georgia. Dean Tate helped UGA through some tumultuous times. I was serving in the U S Army in Texas in 1963 and 1964.Georgia had elected a moderate Governor, Carl Sanders, in 1962. 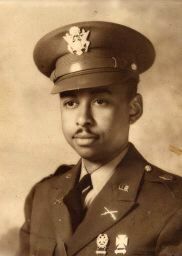 On July 11, 1964, Lt. Col. Lemuel Penn, a black Army Reserve officer from Washington was driving from Fort Benning to Washington and came through Athens. Some Ku Kluxers, meeting in a garage in downtown Athens, saw his car on Broad Street near the UGA Arch and decided to follow him and kill him. His murder was a national headline sensation. However, Gov Sanders condemned it and used state resources to find the guilty party. I was stationed in Texas and had voted for Carl Sanders. I wrote him a letter thanking and commending him for his positive handling of a bad situation. It was later that Martin Luther King came on the scene. He was a national figure and was controversial. I was not tuned into his demonstrations until the marches of the 60’s. I remember lunch counter demonstrations at Woolworths, between Clayton and Broad Streets in Athens. As an Army Lieutenant stationed at Fort Hood, Texas, in 1963 and 1964, I drove across the southern states. In June, 1963, I was enroute to Fort Hood from the family home in Oconee County. I stopped for gas in Jackson, MS, the week that Medgar Evars was shot and killed by an unknown shooter. Demonstrations and protest marches were taking place in Jackson. I remember the service station attendant showed me a sawed-off shotgun near his cash register that he kept for self-defense. It was a tense time .In my job functions, I became aware that the military had contingency plans for occupying Southern States if the violence required it. Fortunately those plans did not have to be implemented. 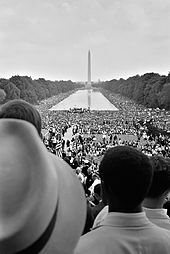 Later that summer, Martin Luther King, addressed throngs of 1,000s in his “I have a Dream speech” on the Washington Mall that became a classic in American History. Born Jan. 15, 1929, Atlanta, Ga., U.S.—Died April 4, 1968, Memphis, Tenn.
Martin Luther King had his admirers and detractors at the time. Even nationally, he was viewed skeptically by many people. (See Jackie Kennedy’s 1960s comments). He was called a “troublemaker’ and worse. By the time of the Birmingham marches, he was nationally known. President John F. Kennedy and Attorney General Bobby Kennedy got involved and got him out of jail. He and the Civil Rights Struggles were in the News often. Television brought it into the homes all across America. On April 4, 1968, Betty and I had eaten supper at Mickey’s (Steakhouse) on Bankhead Hwy in Mableton) and were driving along Austell Road toward our west Marietta home when we heard the news. The announcer said Martin Luther King had been shot at a Memphis Motel. Details were not clear and it took several days for the details to emerge and the later arrest of James Earl Ray. For detail including conspiracy theories, see James Earl Ray and the Assassination of Martin Luther King. The assassinations of John and Robert Kennedy occurred in 1963 and 1968 respectively. Many of us were shocked (shaken) at those events. I remember seeing Bobby Kennedy talking to blacks in Indianapolis, IN, on television on April 4, 1968, the night of the assassination of Martin Luther King to try to calm people and head of riots. In a few short weeks, he was also assassinated in Los Angeles, CA. The sixties were tumultuous and many young people became disillusioned with government and politics after the assassinations of John Kennedy, Robert Kennedy and Martin Luther King. For those who lived through that era, one knows that all three had their warts and faults. However, one can appreciate and respect the progress made in Civil Rights with their involvement. As time goes on, one really appreciates King’s Non-Violence strategy. Such conduct has not always been present on the national scene since the King Assassination. Some of King’s staff went on to higher positions – Andrew Young was Mayor of Atlanta and United Nations Ambassador. 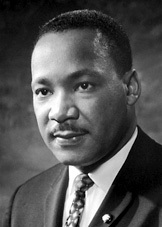 Some have lived off the Civil Rights and MLK associations without contributing a lot of positive acts on their part. Segregation was bad and a way of life that is long gone. As with most things in life, there were some good times during the bad times. One sometimes wonders just how far our society has really progressed in matters of race. I recently read some observations by an American Black who experienced much of the changes. The author, Charles E. Richardson, is a black person who is editorial page editor for the Macon Telegraph. ‘Back when we were Negroes’ – Macon Telegraph-7.31.11 It is a thought-provoking read.